NYPD Celebrates OWS’s Six-Month Anniversary With 73 ArrestsIs this the start of Occupy Spring? Councilman Wants to Gift Thousands to Occupy Wall StreetYdanis Rodriguez has already been arrested for the cause and now wants to donate his city stipend. Police Remove Barricades at Zuccotti ParkProtesters have reentered their old turf. Zuccotti Park Is Still Sort of Locked DownThe NYCLU claims the public park is not so public. NYU Student Flips Out Over Occupy Wall Street Assignment Now these are some insane, department-wide e-mails. 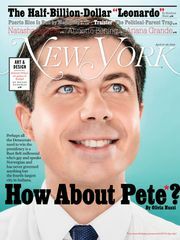 Bloomberg Still Testy About Occupy Wall StreetThe mayor is publicly battling with a New York congressman. Zuccotti Park Owners Didn’t Pay $139,000 in Taxes, City SaysBrookfield Properties claims the finance department is mistaken. Journalists Protest Police Treatment During Occupy Wall Street EvictionMedia organizations have demanded a meeting to discuss the NYPD’s treatment of journalists. Did Bloomberg Win the Battle But Lose the War by Evicting Occupy Wall Street?The mayor scores a tactical win, but at what cost? Judge Rules Against Occupy Wall Street Protesters Camping in Zuccotti ParkThe protesters will not be allowed to re-create their encampment. Breaking: Police in Riot Gear Evict Zuccotti Park [Updated] Occupy Wall Street’s founding mecca has been forcibly cleared out. With the Return of Generators, Occupy Wall Street Can Last Until the End of TimeThe FDNY gave the protesters’ generators back. OWS Protesters Stock Up on Tents Despite ProhibitionOccupy protesters passed a motion to invest nearly $20,000 in large tents. Post Reporter Has Less-Than-Enjoyable OWS SleepoverShares tent with an anarchist and girl in devil getup. Bloomberg Not Pleased With Protesters’ Alleged Internal Security MethodsZuccotti Park crimes must be reported to the NYPD, he said. Man Charged in Two Sexual Assaults at Occupy Wall StreetHe was reportedly working in the kitchen, too. Will ‘Canstructions’ Cramp OWS Style?A lot of humanity at once. Zuccotti Park Is Now a Little Safer, a Lot ColderThe FDNY and NYPD seized generators and gas canisters, making it much more difficult for protesters to stay warm. Winterizing Wall Street: Hypothermia and the 99 PercentLess like a movement and more like a winter survival course. Former Five-Star Chef, Now Broke, Feeds Occupy Wall StreetFrom steak-frites to sleeping bags. Zuccotti Park Chefs Get PunkedCafé OWS not really eligible for grades. The Organizers vs. the Organized in Zuccotti ParkThe drum circle of discord. Protesters Now Have a Professional Chef, Organic IngredientsThe eating is good in Zuccotti Park. Today Is Officially Occupy the World DayWith protests in every major city, including violent ones in Rome. Mayor Bloomberg Finally Visits Zuccotti Park, Calls for Temporary Clearing [Updated]He had a message to deliver.